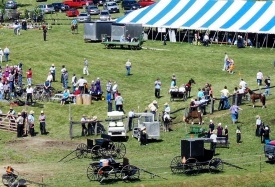 If you’d like to go to an Amish auction in June, we’ve got a list started for you. Below, you’ll find over a dozen Amish sale events in Pennsylvania, Wisconsin, Montana, Ohio, and New York (Update: and Indiana). Among the events listed are a book auction, medical relief sales, school benefits, a Haiti sale, and two Clinic for Special Children auctions. Last month’s auction list expanded quite a bit thanks to the fantastic response from you readers. So if you know of something that should be on here, please tell us in the comments. And special thanks to our anonymous list creator, who has followed up last month’s effort with this one (and already has July in the works!). -June 3, 2014, Tuesday – Railside School Benefit. 68100 CR 43, Millersburg, IN. Supper at 4, Auction at 5. -June 3, Tuesday. Benefit Auction for Kilgore Amish School, 7177 Germano Road SE, Carrollton, Ohio. 5PM. -June 6, Friday – Horizons Of Hope. Large auction to benefit long term care facility for Amish women. 345 S Van Buren, Shipshewana, IN. Auction at 3. -June 7, Saturday – 25th Annual Amish Hospital Benefit Auction, at New Wilmington Livestock Auction, 2006 Mercer-New Wilmington Rd., 1 mile north of New Wilmington, PA, on Route 158, to help with hospital bills. -June 7, Saturday, 8:30 am – Annual Marion Amish Consignment Auction, 10th Annual Spring Quilt & Consignment Auction, School Bake Sale. Benefits the local parochial school. Held on the Lester Lambright Farm, N10405 State Road 110, Marion, Wisconsin, the first Saturday each June. All proceeds support the Marion Amish School. -June 7, Saturday – Book Auction, 8:30 AM, at Gordonville Fire Co., 3204 Vigilant St., Gordonville, PA. Call 717-692-4759 for catalog. 895 lots. -June 7, Saturday – Union County Benefit Auction to support the Clinic for Special Children, at Buffalo Valley Produce Auction , Mifflinburg, PA.
–June 7, Saturday – 4th Annual Amish School Consignment Auction, 9 AM, Freeport, Ohio. Furniture, Farm & Shop Equipment, Quilts. From Freeport take 800 N. to 799 to Kennedy Ridge. Contact: 740-658-4303. -June 11, Wednesday – South Millwood School Benefit. 7896 N 800 W, Nappanee, IN. Supper at 4, Auction at 5. -June 14, Saturday – Kingston Consignment Auction, 8:30 AM, N1046 County Highway H, Dalton, WI 53926. Take Highway 44 West out of Kingston, until you see the Tri-County Produce Auction sign. Turn right at the sign; the site is about 1/2 mile down the road. -June 14, Saturday – 8:30 am, 8th Annual Benefit Consignment Auction at Spring Bank Welding (Centre County). Location: 219 Welding Drive, Rebersburg, PA 16872. Accepting donations & consignments: Quilts, crafts, indoor/outdoor furniture, antiques, collectibles, tools, lumber, equipment, sporting goods, hay, etc. To consign, contact Crist Fisher 814-349-8345; Jesse Peachey 814-349-5377 ext. 3; David Stoltzfus 814-349-5060. For quilts, comforts, etc, contact Melvin & Susan Fisher 814-349-8139. -June 14, Saturday – Annual Somerset County Amish Church Fund Auction, Rt. 669 Springs Road, Salisbury, PA. 830 AM. Furniture, antiques, stoves, horses & cattle, tools, 75+ handmade quilts. 5-6 auction areas running simultaneously. -June 20 & 21, Friday evening & Saturday – 22nd Annual Troutville School Benefit Auction. At the Ben Coblentz Farm, 618 Paradise Road, Punxsutawney, PA 15767. -June 20 & 21, Friday evening & Saturday – New York Haiti Benefit Auction. Penn Yan Fairgrounds, Old NY 14, Penn Yan, NY 14572. Friday: Fish Fry and Roast Beef Dinner – 4:30 PM; Miscellaneous Auction: 6 PM; Cattle Auction: 6:30 PM. Saturday: Food Stands Open 6 AM; Auction starts 8 AM. -June 21, Saturday – East End Amish Hospital Benefit Fund at Crist M. Zook Farm, Milroy, PA. 8:30 AM. Livestock, machinery, household, quilts. Off of Rt. 322 take Milroy exit. Go to traffic light, turn left proceed 2 miles. At ball field turn right, then 1 mile to Back Mountain Rd., go approx. 1 mile to auction site. -June 28, Saturday – 22nd Annual Atlantic Benefit Auction. At the David Mullet farm, Atlantic, PA.
-June 28, Saturday – 16th Annual Benefit Auction to support The Clinic for Special Children, at Shippensburg Auction Center, 1 mi. E of Shippensburg, PA 17257. This isn’t an auction, but we’re also going to include this birding event. In some places birding is quite popular among the Amish, and Holmes County is definitely one of those places. It’s good to have the info. I might try to get up to one in Pa. Montana and Wisconsin are kind of a long drive from NC. I’ll have to check on the ones in Va. to see what’s going on. Thank you Ship, just added them. Interesting to see some mid-week events. Not an auction, but for July throw in Horse Progress Days at Mt. Hope, Ohio, on July 4-5. Will do that, thank you. Very comprehensive Erik, thanks for the information!! The Mennonites relief sale is on this Saturday May 31, 2014 in New Hamburg, Ontario, Canada. Always a wonderful sale, in its 48th year….worth stopping by. I can’t wait until the Haiti benefit at the end of August in Mt. Hope, I will be there..Marie,Windsor Ontario Canada. Carrollton, Ohio. With a Chinese Auction; what is that? A Chinese auction is a combination of a raffle and an auction that is typically featured at charity, church festival and numerous other events. Can also be known as penny social, tricky tray or pick-a-prize according to local custom, or to avoid causing offence. The difference between a raffle and a Chinese auction is that in a raffle with multiple prizes, there is one “hat” from which names are drawn, but in a Chinese auction each prize has its own “hat”. This allows ticket buyers to choose which prize to focus on, as opposed to having a first, second, third, etc. prize. I hope that Amish America readers share photos & info about their visits to any and all the above-mentioned auctions. Photos of quilts and Amish-made wood items (etc.) or unusual auctioned items would be a treat for people (like myself) who must visit these events “virtually”. I hope you all have an enjoyable time, and I look forward to your stories & photos! QUESTION: Any Mud sales in Canada? Looking for Amish / Mennonite mud sales in the St. Catharines / St. Jacobs Ontario. I thought there was one on the weekend of the 14 June, however i lost the information sheet I had. Please send any info you might have, of mad sales across Canada. If you like tractors, a large J I Case Auction Sale is Saturday, June 14, 2014, at 3950 Steffler Road, Elmira, Ontario, For Melvin K Martin at the premises of MK Martin Enterprise Inc., a rare collection. Melvin has been collecting for many, many years. At 10 a.m., Sale of tractors and combines, farm equipment, etc. This sounds like a Mennonite name. Mennonite Relief Sale & Quilt Auction in New Hamburg, Ontario. If these are not what you had in mind, maybe someone else can help you. Join us for the MCC Relief Sale and Auction at Prairieland Park, Hall E, on June 13-14, 2014! Enjoy food, markets, auction and activities for kids! June 16, 2014 – 8:15am to 4:00pm. London, Ontario, Canada. This conference is particularly helpful for service providers to understand the religious and cultural implications of working with the Low German populations. at Randolph Amish Comm. , Pontotoc, MS. The Annual West Kootenai Amish Auction helps to fund the local Amish school, and features machinery, log homes, gazebos, log furniture, cedar furniture, hand stitched quilts, wall hangings, wood carvings, & handcrafted items. They usually sell in three auction rings. The auction is held on the second Saturday in June each year. June 13 & 14, 2014, Friday 4-9 pm, Saturday 6 am until all is sold. June 20 & 21, 2014, Friday 3:00-6:30 pm, Saturday 8:30 am – Addison’s 6th Annual Consignment & Benefit Auction *By Maple Valley Auction, Addison, NY. YODER AUCTIONEERS. Held at Dan B. Yoder (Creekside Greenhouse), 6338 Derby Hill Rd., Addison, NY 14801. St. Rt. 417 to Cty. Rt. 81 between Addison & Woodhull follow signs. All proceeds benefit the Addison Amish Hospital & School Fund. 2nd Annual Amish Beacon Star School BENEFIT AUCTION, Wed, June 25, 2014, 5 pm, Moore, Montana, Amish made wood products, Hand made quilts. From Lewistown, go West 8 miles to Crystal Lake Road, South 4 miles to Seright Road, West 2 miles to Kirkeminde Road, then 3/4 mile South. From Moore, go South 1/2 mile to Seright Road, East 2 miles then South 3/4 mile on Kirkeminde Road. The highest quilt sold for $850, with 135 registered bidders. Here are links for some pictures from the Lancaster County Carriage and Antique Auction on June 26-27. Amish Bank Ads: Funny or Offensive?